Tim Brown is CEO and president of IDEO. He frequently speaks about the value of design thinking and innovation to business people and designers around the world. He participates in the World Economic Forum in Davos, Switzerland, and his talks “Serious Play” and “Change By Design” appear on TED.com. An industrial designer by training, Tim has earned numerous design awards and has exhibited work at the Museum of Modern Art in New York, Axis Gallery in Tokyo, and the Design Museum in London. He takes special interest in the convergence of technology and the arts, as well as the ways in which design can be used to promote the well being of people living in emerging economies. Tim advises senior executives and boards of Fortune 100 companies and has led strategic client relationships with such organizations as the Mayo Clinic, Microsoft, PepsiCo, Procter & Gamble, and Steelcase. He is a board member of the Mayo Innovation Advisory Council and the Advisory Council of Acumen Fund, a not-for-profit global venture fund focused on improving the lives of the poor. Additionally, he writes extensively, with articles in the Harvard Business Review, The Economist, and other prominent publications. 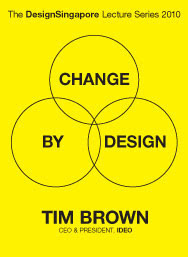 His book on how design thinking transforms organizations, Change By Design, was released by HarperBusiness in September 2009. Tim maintains a blog on the subject of design thinking.